Craig Dwight, CEO and chairman of Horizon Bank, treasures advice his mother Wilma, now 97, imparted decades ago. 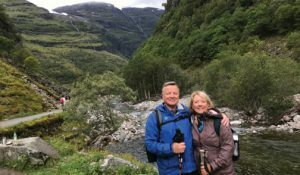 “My mother always said, ‘never turn down an invitation because it’s also a new opportunity,’ which is a good rule to follow,” said Dwight, who shares his travel hobby passion with his wife, Pamela. On Oct. 13, the Michigan City couple returned from a 14-day trip to Africa, including time in Tanzania and Rwanda, exploring new cultures and mountain trek escapes. He said their three grown children and their four grandchildren also have inherited the same adventurous spirit. Of his 39 years in the banking industry, Dwight’s career includes 33 years with Horizon Bank, which has 65 offices, including 15 serving Northwest Indiana. Dwight was born in South Dakota where he grew up with farming grandparents. In the 1960s, his father moved his family to Michigan City where Dwight graduated from Michigan City Rogers High School in 1975 and then earned his bachelor’s degree in business administration from Indiana University in 1979. “What’s interesting is that I never grew up with a family who traveled, not even family vacations,” Dwight said. “My dad always worked seven days a week, and my mother was busy with the garden and household, so we didn’t travel. Dwight’s great love of travel began in his youth when he would spend summers going back to South Dakota where he worked on his grandparents’ farm, as well as weekend trips with his Boy Scout troop and church group. Today, he’s visited 49 states, with Idaho the one destination that has eluded his travels. “A few years back, we were snowmobiling in January through Yellowstone, and we were just six miles away from the state line to cross into Idaho, and almost did, except bad weather prevented us,” Dwight said. His journey log extends throughout Europe, and he recently added his African expedition, along with other favorite international destinations. He enjoys sightseeing, but also seeks out biking, hiking, mountain exploration, skiing and scuba diving. “I’ve been able to scuba dive many places, from Lake Michigan to the Caribbean,” he said. He said he is fortunate, Pamela, his wife of 36 years, has his same adventurous spirit. “My wife shares my same eagerness to discover the world, both near and far,” Dwight said. Though it’s difficult for Dwight to cite his favorite map memories from among so many, he especially loved the top of Copper Mountain in Colorado for the thrill of skiing to the base, as well as the coral reef scuba adventure he enjoyed while at Grand Cayman Island. “When you are scuba diving, it’s very relaxing because of the controlled breathing, which makes it a very slow and rewarding experience,” he said. He also recalls one of his first “pinch me, is this really happening” moments, which was about 1980 during his first trip to Paris. “I remember having coffee just across the street from Notre Dame Cathedral and thinking about how I wrote about this same destination in my high school French class for an assignment about the greatest cathedrals of the world, and suddenly, here I am looking at history,” he said. One of his most exhausting excursions was a 470-mile bicycle ride for seven days in August, spending nights in a tent. “Even though I’ve traveled far across the miles, I always recommend how many close and exciting travel opportunities we have right here in Northwest Indiana for exploring, especially at the Dunes and throughout La Porte County,” he said. “We’ve had our luggage lost or expectations not play out as we had hoped, but you can’t let it ruin a trip or let it frustrate you,” he said. And as for his father’s dream that one day Dwight would visit Disney World, that “check mark” happened with his wife and his own children in the early 1990s. “Now, I’ve been talking with my wife that it’s time for us to take our grandkids with us for a Disney trip,” he said. Click here to read more from the Dec-Jan-2019 issue of Northwest Indiana Business Magazine. Philip Potempa is a 1992 graduate of Valparaiso University. He began covering theater, arts and features stories in Indiana, Michigan and Illinois for The South Bend Tribune in 1992, before joining The Times of Northwest Indiana and Illinois in 1995 where he worked as a features writer and daily entertainment newspaper columnist for more than two decades until November 2015. In 2016, he joined The Post-Tribune and Chicago Tribune Media Group where his columns and feature stories now run in print and online. He is the author of three published books chronicling stories, interviews, recipes and memories from his personal and professional experiences. Released in May 2010, his third book, “Further From the Farm” (Pediment Press) continued the tales of his journalism journey featuring favorite celebrated stories from his interviews, including Mary Tyler Moore, Lily Tomlin, Julia Child, Martha Stewart, Oprah Winfrey, Dolly Parton, Betty White, Karl Malden, Phil Donahue and Bea Arthur. He also is an adjunct instructor in communication at both Valparaiso University and Purdue University Northwest. When not lecturing in a classroom or in a theater seat, Philip divides his time between his family’s farm in Northwest Indiana and his home in Chicago.